The machine is applied to vertical or horizontal cutting to various kinds of paper, such as golden and silvery paperboard with aluminum plated, rainbow paper without plating, laser anti-counterfeiting paper, whiteboard sheet and many sorts of thin paper. 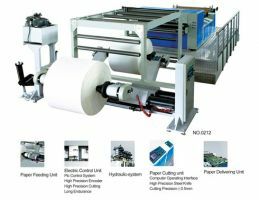 The machine is widely used in vertical or horizontal cutting in trademark, band of cigarette, calendar, box of alcohol, poker and laminating materials of BOPP paper. The machine adopts computer control with PLC color touch screen of human-machine interface holding functions of servo motor, frequency control, fixed length settings, automatic count, sound and llight alarm, etc. It also adopts imported electric components and advanced control method to achieve synchronous operation. It owns the merits of high cutting speed, high cutting precision, stable operation, low energy consumption, low noise and convenient loading. Roll material automatically raised by oil pressure, vertical cut, horizontal cut and horizontal rectification.